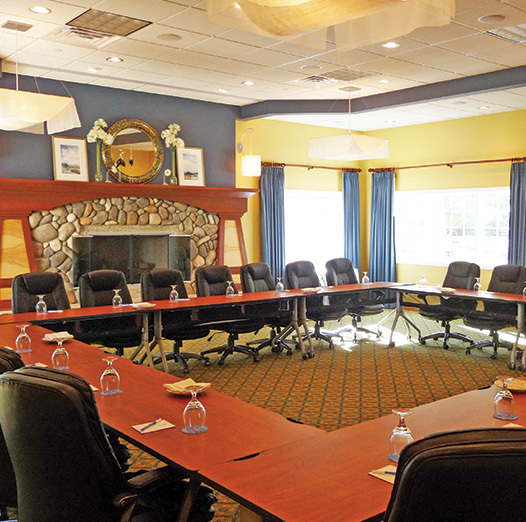 Let our team of meeting and event professionals bring your corporate meeting, team building or social event to life at Bay Pointe. 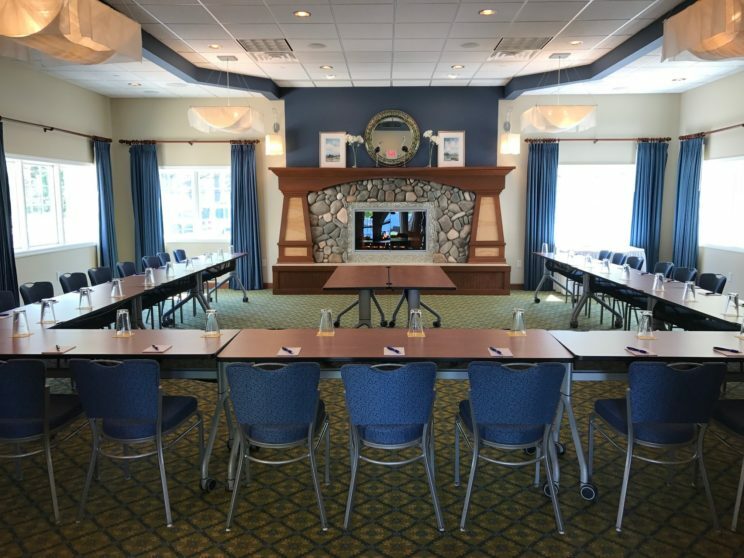 Located on the south shore of Gun Lake, Bay Pointe offers a unique destination that provides state-of-the-art facilities, a variety of inspirational meeting room layouts, thought-provoking outdoor spaces and a variety of floor plans for breakouts for any size group. Our experienced staff excels at successful meeting planning and organizing your staff retreat or meeting for 10 to 300 participants. 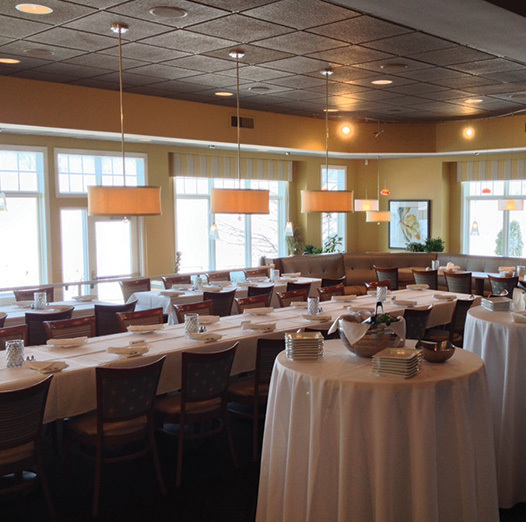 Compliment your event with creative food and beverage options crafted by Bay Pointe's experienced culinary team. 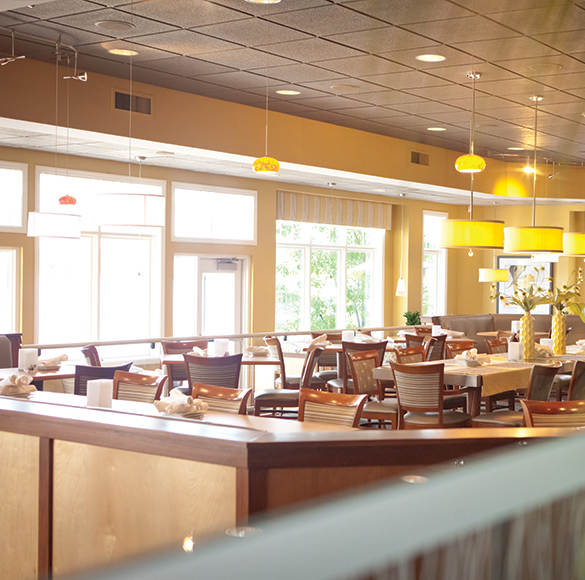 Great food makes an event extraordinary and Bay Pointe is renowned for using fresh high-quality ingredients in our banquet cuisine. Our talented banquet team will insure your guests enjoy a perfectly executed event, complete with custom designed menus that truly reflect the style of your event and your message. Towering trees line the drive as you approach the new Bay Pointe Woods, a unique equestrian style event venue with modern design features; it is a hidden jewel surrounded by ten stylish cottages with walking paths, water and fire features, and picturesque gardens. 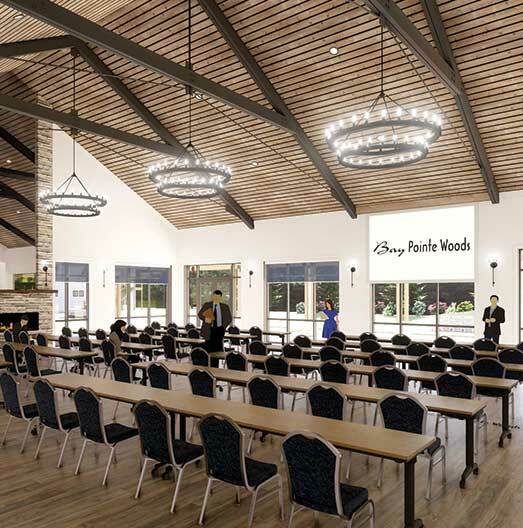 Opening June 1st 2019, Bay Pointe Woods offers versatile meeting space options with state-of-the-art audio/visual capabilities and abundant natural light in a natural wooded setting. 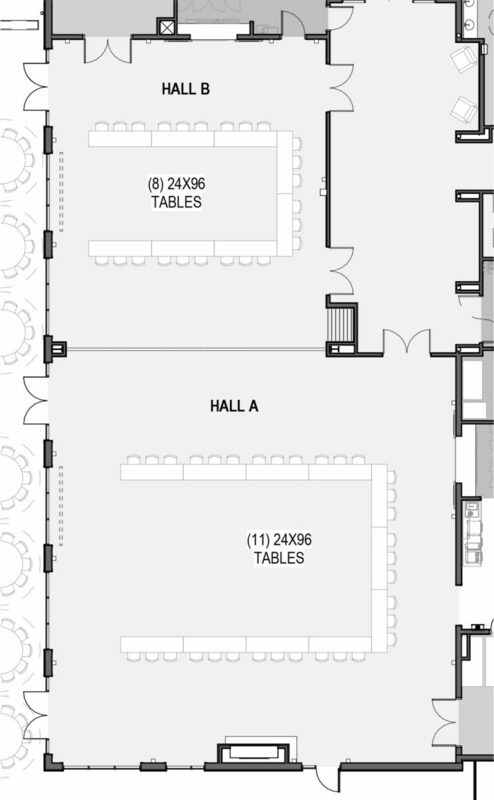 Providing optimum functionality for any size group from 50 to 300 participants. 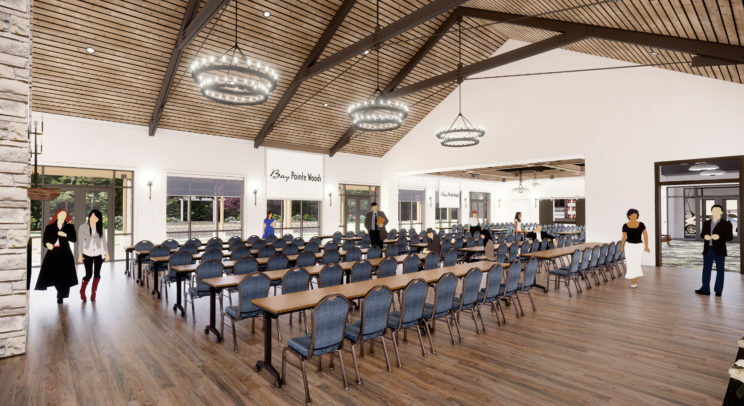 The Woods Ballroom totals 4,090 square feet and can be divided into separate meeting rooms for smaller events, offering theatre, classroom or banquet style seating and more.. 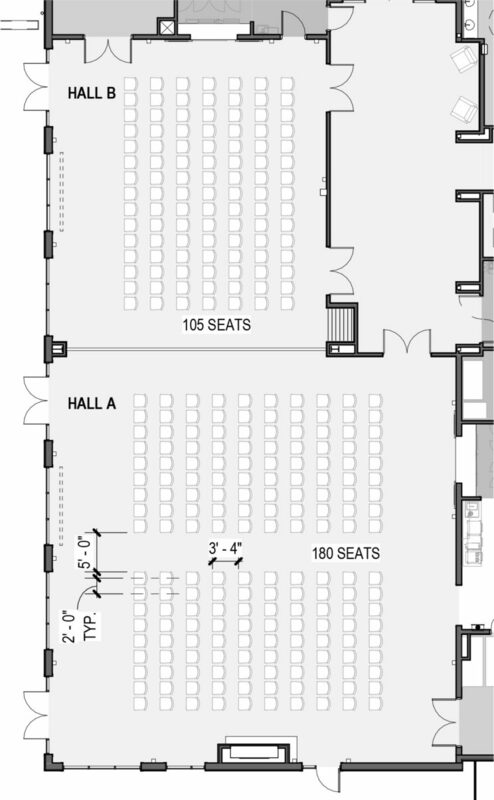 The Woods Ballroom offers a variety of seating configurations for your audience. 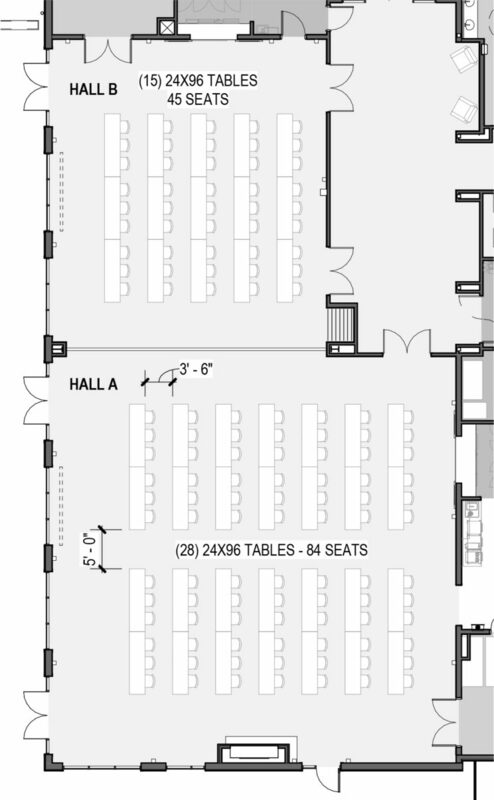 Whether you are setting up for a business presentation, classroom training, introducing a product launch or hosting a full-scale gala dinner, Bay Pointe Woods collaborates with you to incorporate the ideal seating arrangement so your audience receives the maximum impact from your unique event! Below are examples of some configurations. 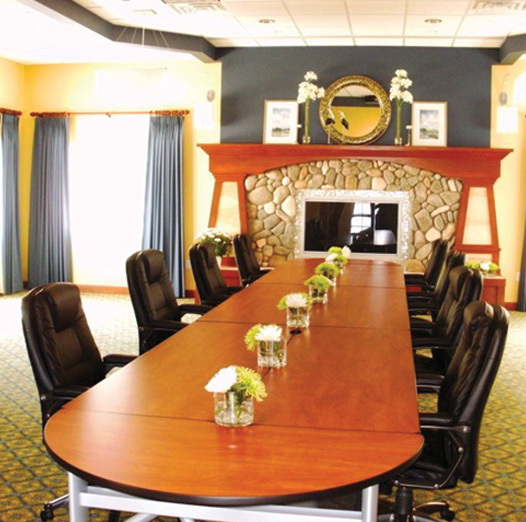 The perfect setting for an executive retreat, smaller meeting or event. 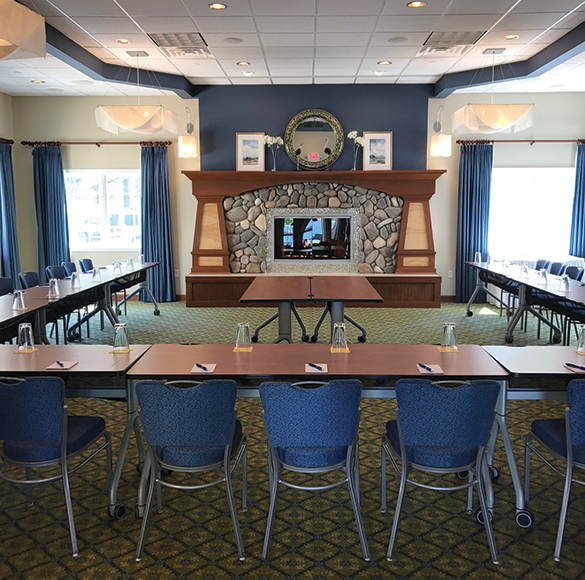 The Fireside Room features a ceiling mounted LCD-HD projector with a 144 inch drop down screen, complimentary Wi-Fi, wireless mic, iPod docking station, 12 ft. stone fireplace, leather executive seating and abundant natural lighting. 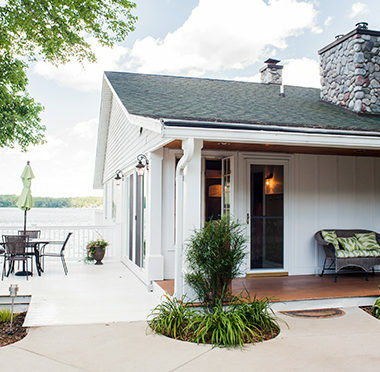 The Lakefront Pavilion is available May-October. 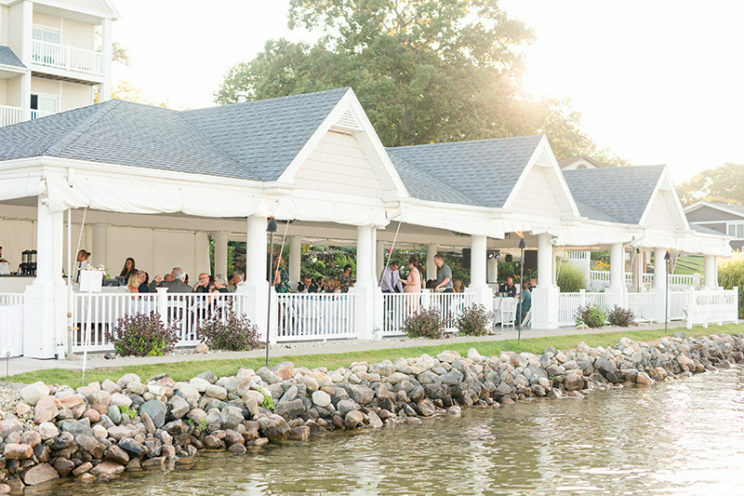 Located on the water with seating for up to 200 guests and over 3,000 square feet of adjacent lawn space. Ideal for a corporate event, annual company celebration or beach BBQ, surrounded by lush landscaping, perennials and seasonal flowers. 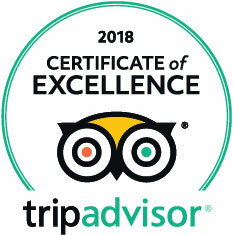 Featuring an outdoor gas fireplace, adjacent patio area, gas torches, granite bar, ceiling mounted gas heaters, and clear sides “we lower in the event of inclement weather” to insure your guests’ comfort. Steeped in history with innovative updates this 5000 Sq. 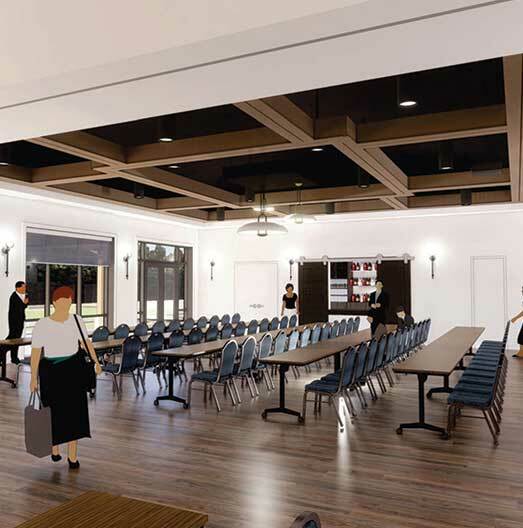 Ft. lakefront estate with three levels is comfortably elegant and the ideal venue for hosting executive meetings, company retreats or offsite meeting for 10-100 attendees. Featuring complimentary Wi-Fi, and presentation capability a spacious balcony and 2500 Sq. Ft. covered patio with soft seating and a firewall surrounded by lush landscaping and a cabana bar in the fountain courtyard. 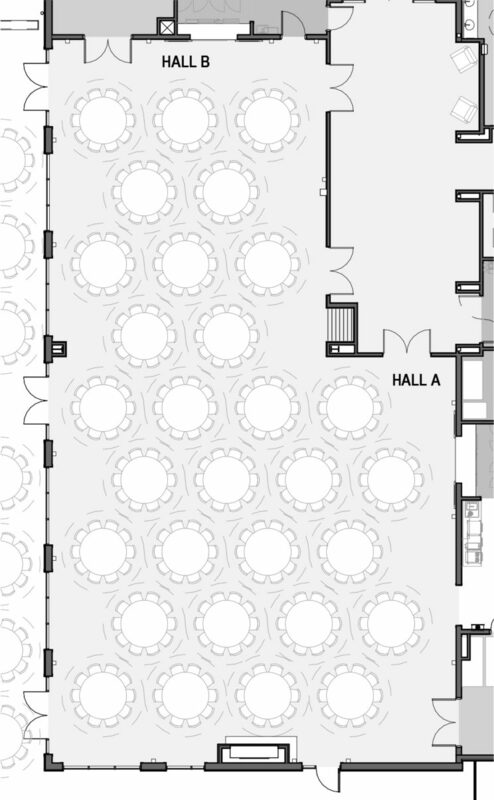 There is the added value that lodging for 15 is included with this event space with 4 bedrooms, 2.5 baths and a loft! 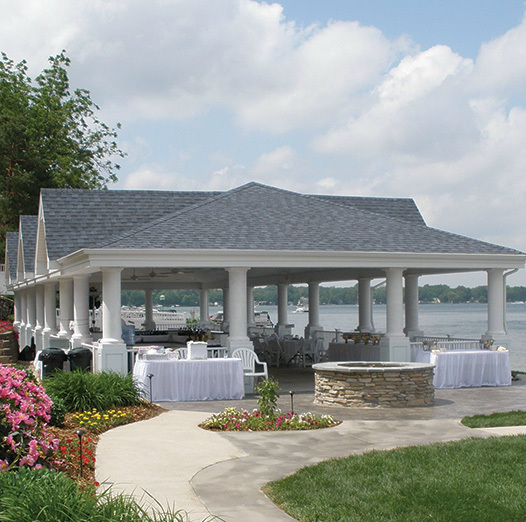 The Island View Patio is the ideal location for your intimate morning or mid-afternoon wedding ceremony. 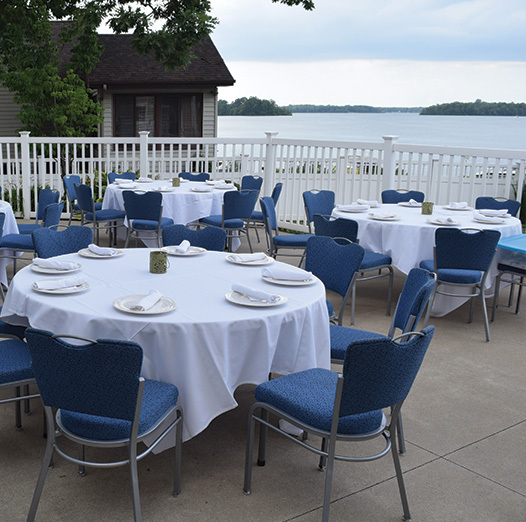 Overlooking Gun Lake, it has a panoramic view of the water. 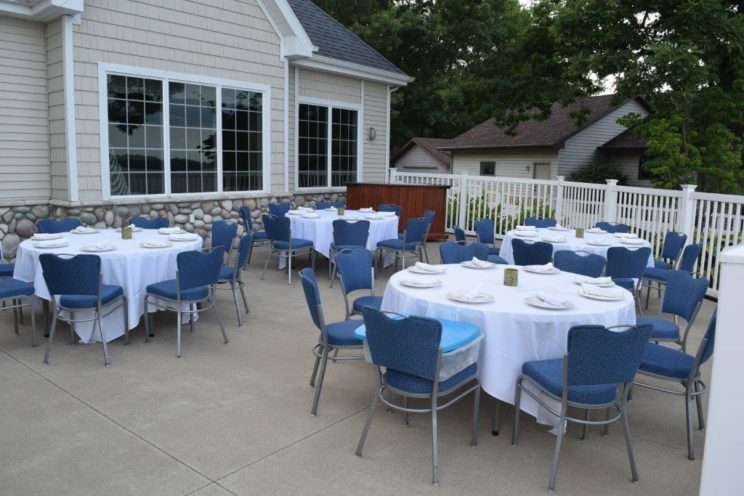 This space is also a wonderful location for an outdoor bridal shower or rehearsal luncheon!